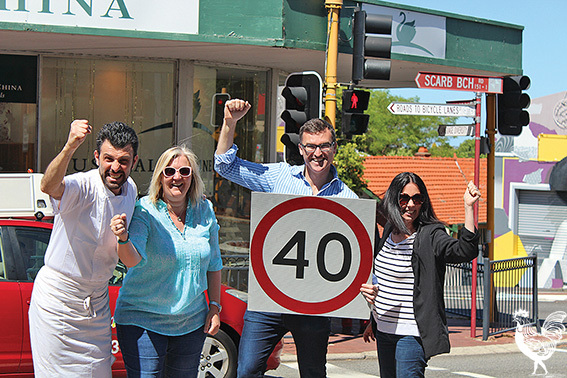 SCARBOROUGH Beach Road through the Mt Hawthorn town centre will now have a 40kmh speed limit. It’s a “big win for the community” and “good for the local economy” says Vincent mayor John Carey. Main Roads agreed to the reduced speed after lobbying by the Mt Hawthorn Hub and Vincent council, which believes a pedestrian-friendly town centre will become more vibrant. Speeds can get down to 30kmh in built-up areas of major European cities like London and Barcelona, so Mr Carey says there’s evidence for the success of lower speed limits. Hub vice-chair Alex Castle says the reform will make families feel safer because they won’t have to worry about cars whizzing past kids. Ms Castle says local businesses have welcomed the reform, but it’s not completely without dissent. While the Chook was taking a photo of business owners celebrating, a grumpy passerby heckled Mr Carey because he thought it would increase his daily commute. The mayor tried explaining the success of European trials, but the disgruntled man stormed off before Mr Carey got to the bit about research showing travel times are not affected. “This view that it then causes greater traffic times is actually not true, based on the research,” Mr Carey later said. “By reducing speed in the town centre you’re making it more people-friendly, making it safer for people to cross the road and walk in the town centre. Mr Carey would also like to see the 40kmh limit extended to residential streets, but Vincent council has been “butting-heads” with Main Roads over the issue and it looks unlikely to proceed.